Trees of Kamnik is a documentary photography project by a group of authors aiming to create objective portrayals of trees growing in their local environment. For the tenth consecutive year, members of the Kamnik Photography Club put on an outdoor exhibition, known as The Eye of Kamnik, in the town centre. Their decision to have a collective concept in this edition inevitably resulted in the relegation of individuals as authors. Individual photographer’s personal creative narration and interpretation no longer matter; instead all are working towards the implementation of a common idea and following a single set of technical guidelines. The reasons behind their interest in trees vary. Some consider trees to be natural elements vital to human survival by providing oxygen and food, others find comfort in trees because they provide shade, fruits, and help us be in touch with nature. While some are more interested in trees set in pristine natural environments, others focus on their role in urban environments where they can be a strong architectural component, either as an aesthetic feature or as building material. As a raw material used to produce paper, trees have also made a major contribution to progress, the advancement of knowledge, and indeed photography. But above all else, trees are living organisms that maintain their own rhythm of life regardless of the pace of human life and development. 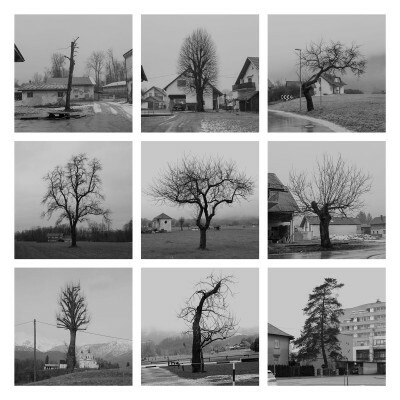 The contributing authors chose to document standalone solitary trees, applying a photographic technique that is as objective as possible: uniform, typological, adhering to the principles of the Becherian aesthetic. Instead of the ‘biological species’, they were interested in the aesthetic compositions and “personalities” of the trees portrayed. This was deemed to be the most respectful approach, suggesting a system in which individual creative egos give way to endeavours made exclusively for the benefit of a larger community, and not only in terms of authorship, but also throughout the conceptual design and production phases of the project. As always, one of the first determinants of the end product is (Flusser’s) the program of the apparatus, while very detailed collective instructions subsequently steer towards a result where each individual’s contribution is obscured and replaceable. In contrast to automated photography, passport photography or photography for biological science purposes, what situates the resulting project in the realm of art is the fact that it can hardly be deemed general-purpose photography.